Earn by Impressions and more by Clicks! Some of you should notice an extra ad on my sidebar rite?Â This ad company earn you cash by impressions and more by clicks when people click on an ad. If you have alot and alot of visitors to your websites, this will be a perfect choice of ad display ^^ In my opinion, it’s better than Advertlets(dun say anything, I quit using it adi o.O) or Nuffnang haha.. This is very profiting for those who have blogs/websites, especially which niche belong to “Making Money Online” and “Internet Business” category. Furthermore, ads displayed are completely interesting and attracting as they’re all related to internet marketing, making money online, advertising etc etc.. Who wouldn’t be tempted to click the ads to find out how to make money online, right? And it’s FREE to join. Over the last 4 months I have used a program called 1800banner and got paid 2 times per month. The procedure is quite simple, I put up a rotating banner on any of my websites and I earn money every time it shows. In fact if a person stay on my website for a few minutes the ad rotates and I earn for EVERY new ad that shows. You may only have one ad per site or you can get banned…but still this is a great way to earn extra cash. Minimum payout is $20 which I easily reach in a couple of days. I don’t have to request payout, it comes automatically and goes directly to my paypal account. You can also use your earn credits to get traffic to your own site and it really is a simple way to get traffic and backlinks for free. Of course there is a referral system and you earn from up to 3 tiers. 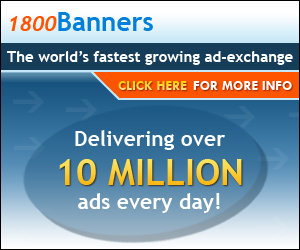 Even without referrals I am earning more with 1800banners than I do with any PTC site. This is definitely a keeper. Credits can be converted to cash so everything’s cashable haha.. Lately, the number of clicks I received in my blog increased, meaning the faster you start now, the more you’ll earn. Why join 1800banners now? It’s free to join and risk-free, and displaying ads related to internet business is the best ad to target readers of your website.